If you're new to playing online slots, then you might find some of the terminology a bit confusing. We're here to clear things up for you with this glossary, which will teach you all of the most common terms. This setting on a slot game will generally allow the game to spin itself, without any need for action from the player. Depending on the game, you can usually set this up to end after a set number of spins or after a prize is won. This can be handy for players, especially on games that they want to experience all the features of. A branded slot is one that features a design or theme from another creation. They may have characters from films, books or even other games. These can be based on a whole load of other creations, with superhero slots, musical themed slots and more. These can be a big investment for the developer, as they have to agree to pay the licensing to use the original characters. A payline is the area that you have to match symbols on to win. Some simple games have just one of these, but others can have hundreds. These can be adjustable, but bear in mind the less paylines you have enabled, the lower your chances will be of matching up those symbols. This kind of jackpot is generated by players, with a percentage of each wager being added to the prize pool. They'll usually be started off with a seed amount of money to make it lucrative for players and then funds will be added by wagering players. 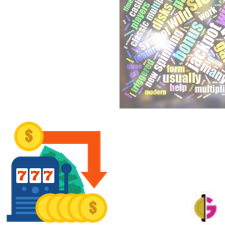 Some games can even have more than one progressive jackpot, with different proportions being added to the different jackpots. This stands for Return to Player, which is a theoretical average of what you would win from any given game. It's calculated by understanding how many times out of 100 a player would win. Most slot games fall into the high 90% range, whereas table games like blackjack can be closer to 98% with the correct strategy. This is a kind of special symbol that can create a winning combination, even if they're not on a payline. The name scatter comes from the fact that these symbols can pay out even when they're scattered over the reels. They might also give you access to the free spins bonus of a game. This is a wild card symbol, which is able to stand in for other symbols on the reels. This tends to make it easier for you to match up symbols, as it can combine with more different symbols. They don't tend to stand in for other special symbols but they can add another multiplier into the combination. Now that you know the most common slot game terms, you can go ahead and get playing! Check out our gaming lobby to put your newfound knowledge to good use.